If I had to sum up this day in two words, they would be wonderful and exhausting! We started our day way before the sun came up, heading to the airport for a 6:00 am flight to Venice. We all slept on the plane (and on the floor in the airport and in the taxi to the airport and I think Julia even may have dozed off standing up at one point today.) Nevertheless, landing in Venice we were energized by our arrival in Italy. Now, usually you don’t think of the taxi to or from the airport as an attraction, but today it was as we boarded a private water taxi which took us to our hotel. The boat was beautiful and the views from the water were amazing. Even Anna enjoyed it despite an aversion to boats. After dropping out luggage at the hotel we headed out to explore the city. We learned very quickly that even with a great sense of direction, a map, and Google, Venice is still a very hard city to navigate. But, getting lost is part of the experience. Alena gets a gold star for the day for saving us from total confusion with her map reading skills and for realizing that small dark narrow alleyways are actually roads too. While out and about we had our first taste of Italy at a local shop with beautiful pastries and great coffee! The pick-me-up was much needed and was delicious. As we walked and drank our coffee and hot chocolate, we discovered that around every corner there is another church or magnificent building. The architecture and density of the city is really outstanding. We finally made it to the Jewish ghetto. While visiting the Hebrew Museum, we enjoyed seeing all the old, beautiful silver ritual objects – Torah ornaments, etrog cases, chanukiot, and more. 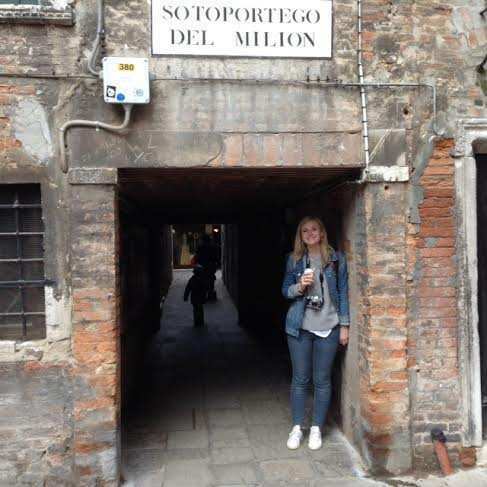 We also learned that the ghetto in Venice was the first ever ghetto and it was established exactly 500 years ago in March, 1516. 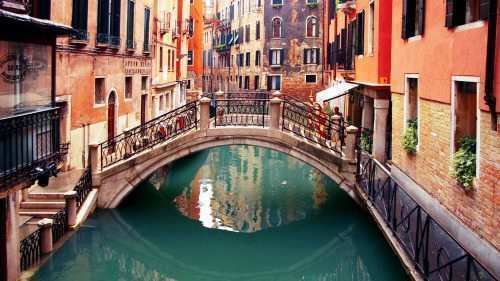 The word ghetto derives from a similar Venician word. 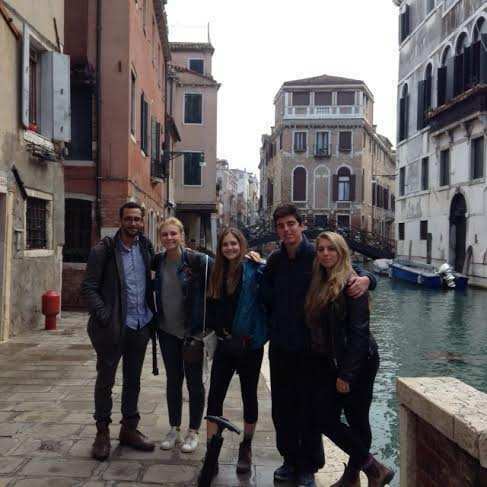 Through our visit, we understood how the Jewish community’s history in Venice evolved and ultimately how the community was all but destroyed in the Holocaust. At lunch crept up upon us we again got lost trying to make our way to the restaurant. But once we finally made it, we discovered it was well worth the effort. Eating authentic Italian pizza was a big treat. 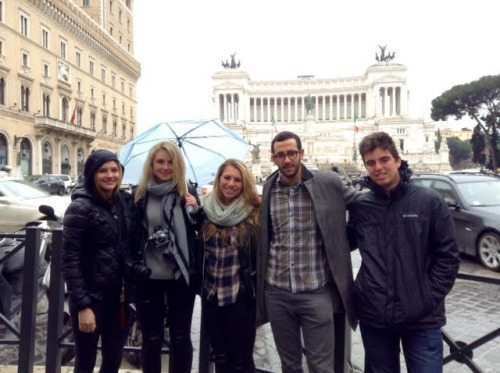 In the afternoon, we were joined by Federica, a lovely professional tour guy who has worked with our groups in the past. She let us through Venice sharing with us an insider’s understanding of this amazing city. We were all interested to learn how Venice was built and could not fathom that the whole city is basically perched on tree trunks drilled deep into the silt of the marsh. 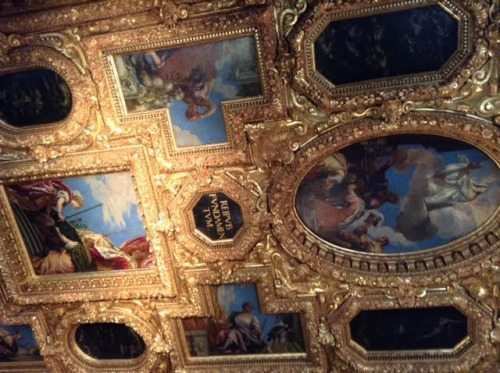 Visiting Doge’s Palace, we all really enjoyed the unbelievable artwork as well as the stories out guide shared with us. The Doge was the ceremonial head of state in the Venetian government. The palace was actually the seat of the government containing the Doge’s residence but also, court rooms and administrative offices. The architecture as well as the artwork are all filled with symbolizing meant to send messages of justice, strength, fairness, and power tempered with oversight. The entire Venetian system was very focused on checks and balances and an avoidance of too much power be granted to any one person. From the palace, we crossed over the famous Bridge of Sighs to the prison next door. Next we had a few hours of free time to explore and shop, and rest and shower back at the hotel before we went out for the evening to see a funny and informative play about the history of Venice, the masks the city is famous for, some of the notable where from Venice, like Marco Polo and Casanova. The play was great using multimedia in addition to a live acting. Gil mentioned after the play how cool it was to have learned more about some of the places that we saw today and to have recognized them and the stories from our earlier tour. Because of the timing of the show, we did dinner in reverse today starting out with a delicious dessert of gelato before the show and afterwards we got a taste of home with dinner at the Hard Rock Cafe. Just when we thought our evening was ending we faced a significant challenge getting home to the hotel. High tide was in and many of the streets were flooded. While getting our feet wet may not seem like such a big deal, when you consider the fact that most buildings in Venice dump their sewage directly into the canals, you can understand why we didn’t want to just trudge through the puddles (puddles being an understatement here). Earlier in the day we had seen city workers setting up platforms throughout the city to allow tourists to stay dry. Our route home had no platforms to walk on so instead each time we reached an area where the water levels were on the sidewalks we turned around and tried another way. I’m happy to report that we were successful and we made it home dry.They day was wonderful and we will all sleep well tonight in our beautiful hotel! It’s hard to believe that we’ve only been in Italy for two days. Everyone is truly enjoying themselves and we’ve seen, done, and learned so much already. Today we started out in Venice with a lovely breakfast at the hotel and then headed out to catch a water bus to the train station. As we walked to the bus stop, we talked about the logistics of using small low boats for everything in the city – deliveries to stores, garbage pick up, ambulances, the school bus… All by little boats. The water bus travel down the Grand Canal and although it was bigger than the local boats, it still wasn’t so big. Reaching the train station with 10 minutes to spare before our train was meant to depart (being on time seem to only really concern me. I guess the students realized that we had planned the timing fine) we discovered that our train was running half hour late. This gave us time to check out the stores in the train station and there was an opportunity for Gil to dazzle us on the piano. It was pretty cool to listen to him play in the middle of a busy train station in Italy. Our train finally arrived and we got on board, settled in and relaxed during the journey to Florence. Our hotel in Florence is located a few minutes walk from the station which made it easy to drop our luggage and head on out for a full day of touring in this beautiful city. The hotel is quite beautiful too actually! As we made our way through the city we had a chance to appreciate the Mercato Centrale as we walked through this market and checked out the seemingly endless stalls of leather products and other locally produced items. Finally we reached the stunning Great Synagogue of Florence Before going in we had a delicious lunch at a lovely dairy Italian kosher restaurant next door. We highly recommend the fried artichoke among other things! The synagogue was simply phenomenal. Unfortunately we were not allowed to take any pictures there, inside or outside the building, but it’s worth googling so that you can see how simply stunning it is. It may be hard to appreciate from a photo though how incredible the size of the building is – it took our breath away. After climbing the stairs to the museum and balcony we were able to see just how high the ceiling and dome really are. 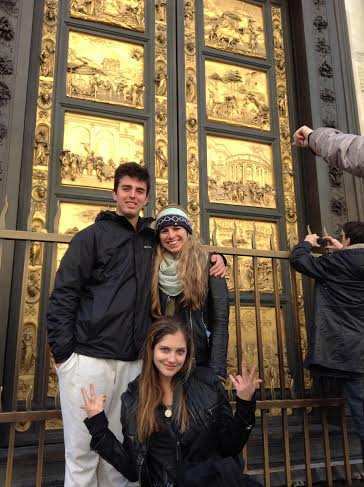 Our next stop was the Cathedral of Saint Mary of the Flower – known as the Duomo of Florence. This church is clearly the centerpiece of the city. The construction of the building began in the late 13th century but was only completed a bit more than 200 years later. A UNSCO World Heritage site, this basilica is one of Italy’s largest churches and it’s dome is the largest brick dome in the world ever constructed. As we headed back to the market for a snack and more shopping we discovered not to rely on Apple Maps. Or maybe we just discovered not to argue with Gil when he says we are going the wrong way (uh, my mistake…). Let’s just say we took the scenic route and gave ourselves and opportunity to support the local taxi drivers. In any case the Sicilian cannolis were worth the wait. 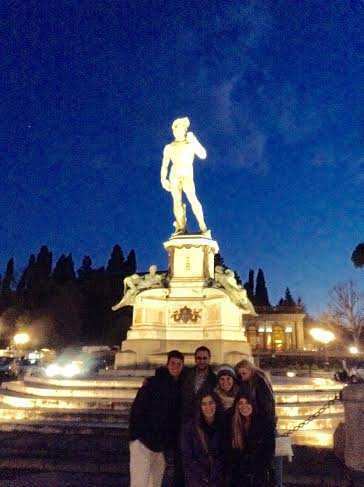 Our last site of the day was the beautiful overlook at Piazzale Michelangelo where we watched the beautiful sunset and gazed out on the whole city as the lights went on to illuminate it in the evening. We also had the chance to see the first of several reproductions of the famous David statue (and tomorrow we will see the real thing!) Later in the evening as we finally made our way back to the hotel we saw the second reproduction of the David outside the Uffizi Gallery. The Piazza in front of this gallery is filled with amazing statues. Seeing them all lit up at night was really a treat. We also enjoyed the window-shopping along the way – just as Kobi – we picked out a great pair shoes for him, all sparkly a we picked out a great pair of shoes for him, all sparkly and chic. Dinner this evening was a two and a half hour, delicious and relaxed meal. Gil and Alena picked the restaurant and no one was disappointed, in fact quite the opposite! The owner of the restaurant was our server and he took a lot of time to explain to us our options and a bit aboutItalian food. We sampled for different types of mozzarella, enjoyed amazing pasta, and topped it all off with a dessert of tiramisu. I have to say spending time with your children is really delightful. We all had such a nice time at dinner and it really was the perfect way to end our day. We packed another day to its fullest today! 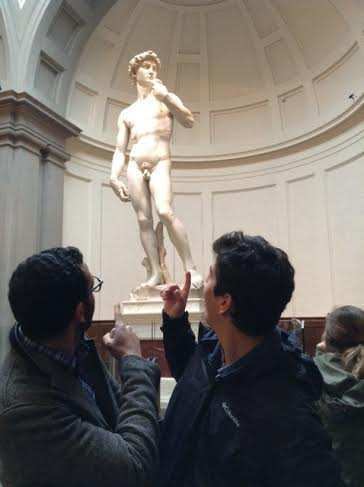 Our morning began with a visit to the Accademia Gallery to see Michelangelo’s famous David statue. I almost felt bad for the other artwork in the gallery as it is all significantly overshadowed – literally and figuratively – by the 17 foot tall masterpiece. We were amazed at the enormity of the statue. We also enjoyed seeing some of Michelangelo’s unfinished pieces which are also on display in the gallery. It was interesting for us to consider that Michelangelo was only 26 years old when he began work on David and he completed it in less than three years. The remainder of our day was spent outside of Florence on a day trip with a wonderful tour guide, Natale, who has guided for Aardvark International for years. He took us on a scenic drive to the Tuscany countryside pointing out many interesting things along the way and sharing many stories with us. Our first stop was the medieval walled town of San Gimignano with its famous tower residences. The historic center of this town is a UNESCO world heritage site. We had a wonderful time exploring the old city and especially enjoyed the beautiful views from the atop the hill on which the city is built. We also of course took time to taste the world’s best gelato and drink espresso. Throughout the town there were shops selling items made from olive oil, beautifully painted pottery, and other locally made crafts. We really enjoyed meeting several of the shop owners as well. Having the chance to hear from the local residents made the visit extra special. Natale also took us into the basement of one building which was carved out as a food cellar and explain to us how the people stored their grains and other items below ground. And, we saw the well which supplied drinking water to the family who once lived in the building. Another building we entered was an art gallery and we were stunned at the size of the large room inside. The facade of the building did not suggest such a large space inside. 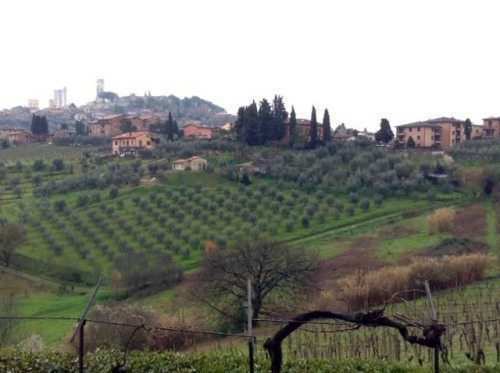 The town of San Gimignano is also known for the white wine, Vernaccia di San Gimignano, produced from the ancient variety of Vernaccia grape which is grown in the area. With that in mind we moved on to lunch at a local winery which is owned and operated by a small family. Lunch was simple but absolutely delicious. We had the chance to sample a variety of cheeses, eat some delicious pasta, munch on a variety of types of bruschetta made with toppings such as tomatoes, white beans, onions, and eggplant. 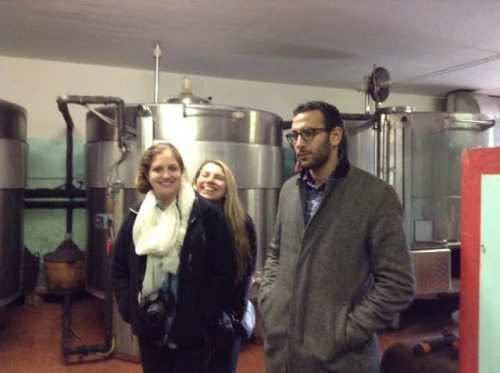 Of course we also had the chance to sample six different wines locally produced by the winery and learn a lot about wine, the wine making process and Tuscany. We were also treated to a beautiful serenade in honor of international women’s day by Jessica the young woman who was our hostess and a very talented singer. Another highlight of lunch was sampling the locally produced olive oils including flavored oils such as truffle, rosemary, garlic, and more. 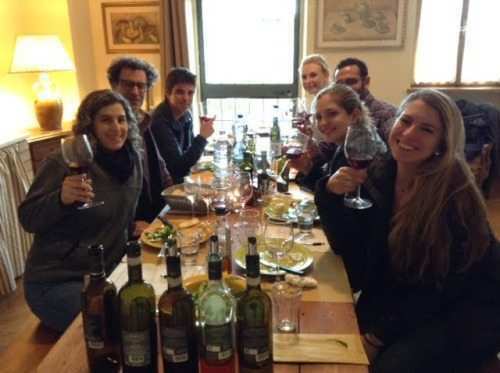 The students all enjoyed meeting the 20-year-old son of the winemakers, who also now works as a winemaker and the family’s two beautiful dogs. We moved on to the city of Siena. There we visited the synagogue and met Anna, a woman originally from Rome but had lived in Siena for most of her adult life. She shared with us a lot about the architecture of the building, the history of the community, and a bit about her own personal history. We learned that her husband’s family survived World War II by hiding out at a farm that they had bought anonymously at a time when Jews were not allowed to own land. Her own family survive by being hidden in the attic of a home owned by gentiles in Rome. The Jewish community of Siena now only has about 50 people but they continue to remain involved in Jewish life and the synagogue is beautifully maintained. We were surprised when we first walked in the building because from the outside it looks very plain and there is no sign of it being a synagogue. 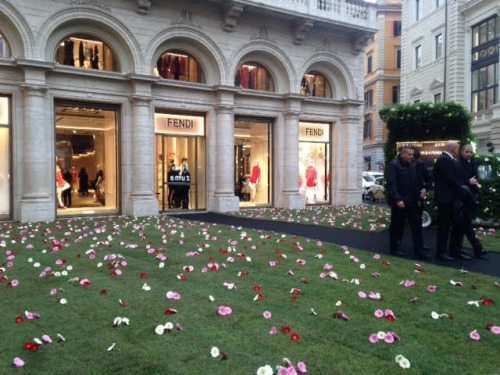 This was the total opposite of what we saw in Florence. 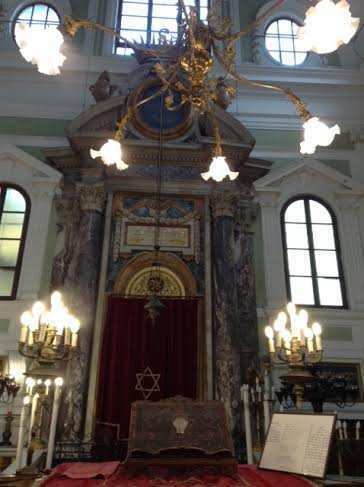 The interior was also not ornate like Florence’s shul but it was beautiful in its simplicity. Our visit to Siena also included a local bakery where we tasted traditional treats of the region. We also met the baker who welcomed us to his town and shop. Next we had a chance to see the center of the town which is transformed once a year for a famous horse race. Driving through Siena upon our arrival we also saw the city’s important churches and got a nice overview of the city. 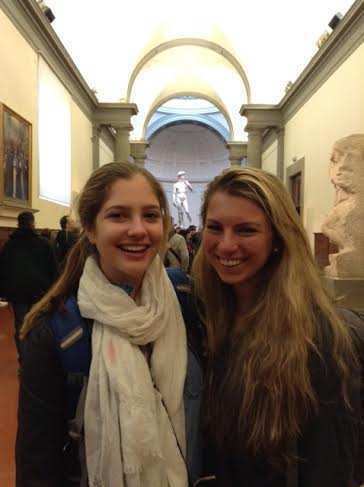 Once back in Florence, we picked up our luggage at the hotel and headed to the train station. We arrived safely in Rome and enjoyed our dinner on the train. Our hotel in Rome is in a great location, near the Trevi Fountain and Spanish Steps which we will see tomorrow. We can hardly believe it’s only been three days so far that we’ve been here in Italy. It feels like so much longer since we’ve done so much! Today would have been perfect if it hadn’t rained all morning. But even with the less than perfect weather we still had a wonderful day thanks to the umbrellas we all bought (and for the record, we couldn’t agree on whether the guys selling overpriced umbrellas outside every major site was exploitation of the tourists or offering a valuable service to those of us that didn’t want to get wet.). We started the day with a beautiful walk to the Colleseum and Roman Forum. Along the way, we saw the Column of Marcus Aurelius in the Piazza Colonna. Since the column is only a couple minutes from our hotel, we quickly realized that there are ancient structures and ruins around every turn in this city. Moving on we saw the massive and beautiful Piazza Venezia. Reaching the Colosseum we met our guide Marco who first took us to a nearby church to see an important work of Michelangelo. Hidden within the piece are interesting features which reveal to us a bit about Michelangelo’s opinions. 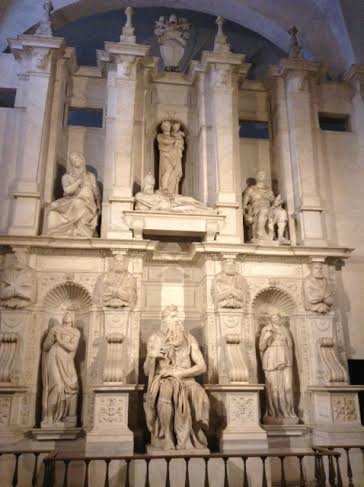 For example this piece is the tomb of the Pope who was serving at th time Michelangelo was working on the Sistine Chapel. He insisted that Michelangelo take a break from painting to build his tomb so that it would be ready for him when he died. The tomb features Moses and the Ten Commandments at the center and a smaller image of the Pope above him. This may have indicated that Michelangelo felt the Pope should be more humble and it also gives a clear indication that Michelangelo valued the Old Testament and felt the Pope should value it more as well. We then explored the Roman Forum. There we spent a lot of time viewing the Arch of Titus and discussing the significance of the imagery of the menorah being carried into Rome after the destruction of the Second Temple by the Romans in 70 CE. Throughout the Roman forum our tour guide gave us insight into the society that had lived and ruled in this area since ancient times. We also visited the site were Julius Caesar was cremated and buried. 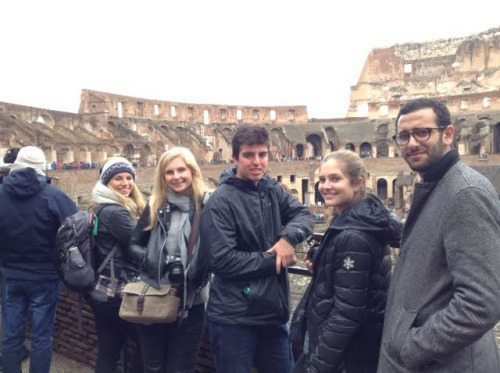 Throughout the tour our guy had contextualized ancient Roman history with our own Jewish history. 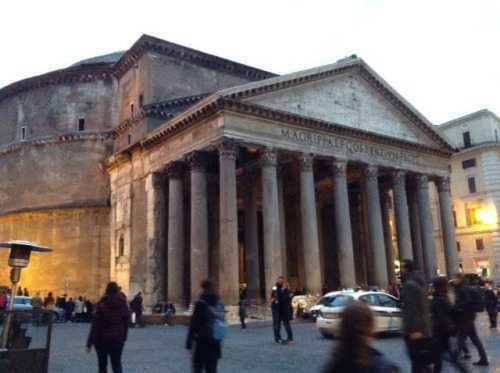 For example, we learned that the first Jews to settle in the area of Rome came in the year 161 BCE. They had come on behalf of the Maccabees seeking assistance from the Romans and fighting the Greeks. Although they were turned down they decided to stay and there’s archaeological evidence of their synagogue just outside of Rome. Inside the Colosseum we all marveled at it’s construction. To be honest, I’m not sure I have to say any more about this as the Colosseum speaks for itself. In the afternoon, it stopped raining (yay!) and we went on a very interesting tour of the Jewish museum, synagogue and ghetto. Ou guide, Sara, was delightful and we all really enjoyed hearing more about this unique community. It was a great day and we are all exhausted. Dinner lasted for hours again as we enjoyed our meal and the conversation amongst everyone was really interesting. We started off our last day in Italy at the Israeli Embassy in Rome with an informative meeting with Rafi Erdreich, the Director of Public Affairs. He discussed with us the relationship between Israel and Italy and with the European Union. It was fascinating to hear about how the Embassy is really succeeding in combating the anti-Israel BDS movement in Italy through developing relationships with the universities in the country and other key people. He also shared with us how public opinion towards Israel has changed slightly over the last year as the result of the refugees streaming into Europe from the Middle East and other regional conflicts. These issues have served to distract Europeans from the Israel-Palestinian conflict to some extent. With the increased number of Muslims in Europe, many Europeans are concerned about the potential changes to the cultural identity of Europe and it is serving to shift opinions towards the Middle East as well. However, he also talked about the recent decision of the EU to mandate labeling of products manufactured in the territories. Our next stop was the Vatican. “Sensory overload” is how most of us described our visit to the Vatican Museums. Wandering through the museums, you are surrounded by priceless art – on the walls, in displays and on the ceilings. There is virtually no white space. And, there are such crowds constantly visiting the museums that in many of the rooms you just flow forward with the stream barely able to stop to look closer at the artwork. 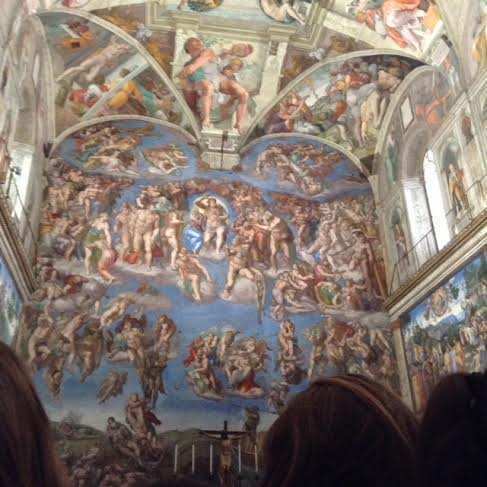 Until you get to the Sistine Chapel (in which every inch is also covered with art.) Standing in the chapel, we had time to stop and gaze at all the images and scenes completed by Michelangelo and others. It was incredible! Moving on to St. Peter’s Square we were again impressed by the size of the space and the structures all around us. 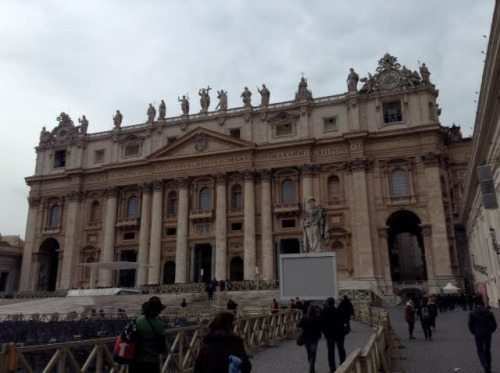 Upon entering St. Peter’s Basilica, we were breath-taken. It is simply stunning. Between the size and the decorations, it’s impossible to not find yourself in awe. 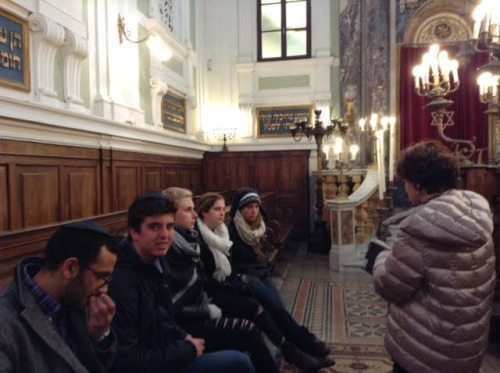 During our tour of the Jewish Ghetto on Wednesday we learned that three Popes have visited the main synagogue in Rome to meet with the Jewish community and the current Pope is one of them. It was a positive visit and he requested to meet with members of the Jewish community and not just the leaders of the community, a request which impressed many. In the afternoon, we had an amazing lunch (thanks to Gil and Alena – they picked the best restaurants the whole week!) Our favorite dish seemed to be unanimously a potato and cheese appetizer with truffle infused olive oil. Much to Kobi’s delight, the pasta at the restaurant was hand made fresh that morning. And, speaking of food, Anna’s perfect streak of having gelato every day of the trip – I guess she’ll just have to go back to Italy again some time! Once we were all checked in at the airport, it was time for the moment of truth – revealing who was Italy’s Aardvark Top Traveler. As most of you read in previous trip emails, just like every great reality show, at the end of each of our trips, one student is crowned as the winner. It was a tough choice this time as all the students were really wonderful all week. Kobi’s passion for pasta was admirable, Anna’s dedication to gelato was inspiring, Julia was the only student to pose for every single photo I wanted to take, but ultimately it came down to Gil and Alena for their amazing restaurant picking skills which benefited all of us. Ultimately, Gil was eliminated for being an amazing navigator, but nevertheless letting me get the group lost in Florence (although I did appreciate his compassion in allowing me to think I was right about the directions.) 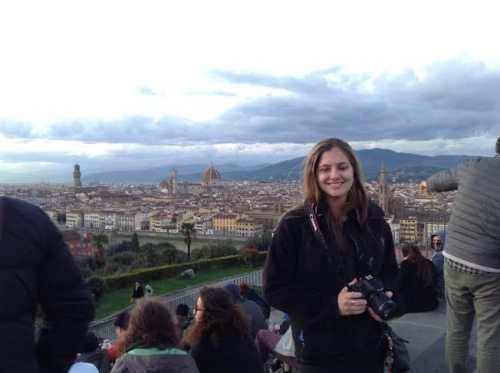 So, the 2016 Italy Aardvark Top Traveler was ALENA! 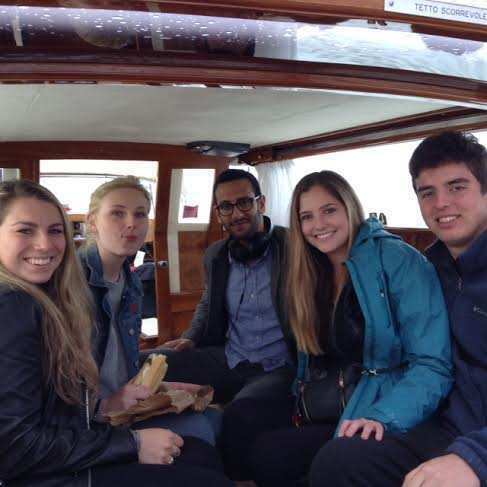 The trip was really wonderful and the students were delightful to spend time with. 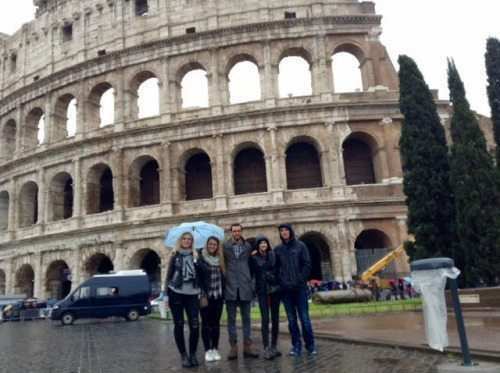 Your children took advantage of every opportunity to learn, explore, and appreciate the opportunity to be in Italy (even despite the rain which we encountered every day!) 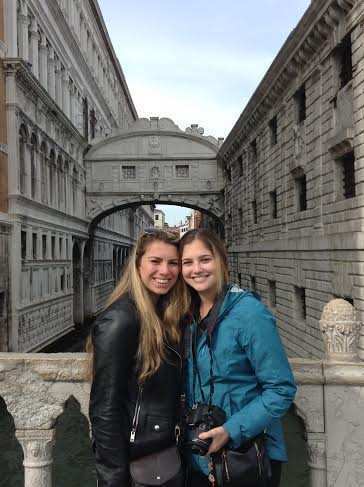 They understand how fortunate they are to have this incredible chance to learn through exploration and they are looking forward to having another three months in Israel to do so as well as a couple more trips ahead for some of them.